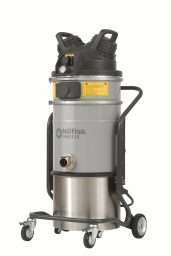 Single phase industrial vacuum cleaner. Brushless motor high performance machine. Less maintenance and is suitable for continuous use. The innovative PullClean system effectively cleans the antistatic star filter while the vacuum is running. The optional HEPA14/ULPA15 upstream filter is the perfect choice when collecting fine dusts. The modular design makes it extremely easy to service and upgrade in the field. With its 400 mm diameter​ the VHS110 ATEX is compact in order to be easily used everywhere. 37 litre capacity removable stainless steel container. The simple design makes it easy to clean and sanitise.